The SABR/Baseball-Reference Encyclopedia (SABRpedia.org) is an initiative in organizing our collective knowledge of baseball online, through a longstanding partnership between SABR and Baseball-Reference.com. 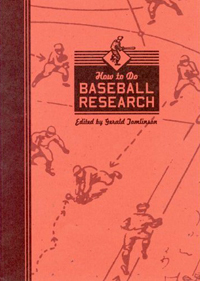 The goal of the Encyclopedia project is to be the first stop on the Internet to find information resources on any baseball-related topic, both within SABR's existing structure of publications, committees, and chapters, as well as in other sources. The SABR/Baseball-Reference Encyclopedia re-thinks the concept of an "encyclopedia" on a sports topic. Most print encyclopedias on sports are first and foremost collections of statistics and other tabular data. However, encyclopedias in other domains of knowledge are primarily collections of brief articles with external citations. The SABR/Baseball-Reference Encyclopedia bridges this gap. Statistics are an essential part of the culture of baseball, and the Encyclopedia uses Baseball-Reference's vast statistical data to provide a repository for information about any given subject. The Encyclopedia does not aim to compete with deep querying and analytical tools that already exist for quantitative data. Instead, the Encyclopedia complements this data by organizing links to source materials, providing background narrative, and covering topic areas not traditionally featured in statistically-oriented encyclopedias in print or on the Internet. The Encyclopedia is a way to find research on various baseball topics. The Encyclopedia is a platform to encourage and support collaboration among SABR members. The Encyclopedia is a community-edited prose encyclopedia of baseball. The ordering of these objectives comes from how these roles fit within SABR's mission. Over the last 40 years, SABR has published enormous amounts of research content in journals, books, and committee and chapter newsletters. These publication venues have traditionally been aligned along SABR's committee and chapter structure, which is a sensible approach for creating publications. However, when looking for prior research or existing information on a topic, people want to organize their searches based on topics. A player may have been mentioned in committee newsletters published by the Minor Leagues Committee, the Business of Baseball Committee, the Records Committee, and others, as well as appearing in journal articles and convention publications. SABR has not in the past been able to provide a user-friendly interface to pull that information together. The Encyclopedia is designed to fill that gap. With a little collective effort, visitors to a person's page in the Encyclopedia will be able to easily browse references to that person across all SABR publications, with significant resources on the person being featured prominently. The Encyclopedia will provide a basic starting point for organizing new research as it comes online. Over time, materials originally published in hard copy will be added to the online collection, and gradually older resources will also become available. It will likely take a few years for this process to be realized fully. There will be some volunteer opportunities to become involved with this process. The main contribution a SABR researcher can make to helping the Encyclopedia grow in this direction is to begin using the Encyclopedia to look up research on a topic, and suggest better ways to organize and present links to resources. Want to help out? Read how to contribute. A challenge in getting a new collaborative project off the ground is organization. Researchers scattered across the country or across the world may share a common interest in working on a project, but without some system for coordinating efforts and sharing information, getting a project going and keeping it going can be a challenge. In the past, project organization almost always meant someone volunteering as a central "curator" who maintained a "master" version of information on his own. Contributors had to send, physically or electronically, new or updated information to the curator, who reviewed it, formatted it, and incorporated it into the master version. Such a system is effective when it works, but it relies heavily on the willingness and ability of one person to undertake a heavy burden of administration, and when life circumstances make it difficult or impossible for that person to continue administering the project, it may fail, and waste the efforts of many researchers. The Mediawiki software which is the foundation of the Encyclopedia is designed with distributed collaboration in mind. Given that mention of the MediaWiki software used to run the Encyclopedia immediately calls to mind Wikipedia, it may be surprising that this function is listed third. Certainly, prose articles on baseball topics will be a part of what the Encyclopedia will provide. This is a longer-term goal; with pages on over 170,000 people and 40,000 professional teams alone, writing even a paragraph on each would take lifetimes. Furthermore, for many topics, there are already good articles written as part of the BioProject, published in SABR journals, or available elsewhere, such as Wikipedia. There is no need to reinvent the proverbial wheel. Instead, the Encyclopedia will help organize pointers and links to those resources. Instead, in the short run the Encyclopedia will focus on being a repository for brief summaries and pointers to sources, especially primary sources. Many Encyclopedia entries will consist mainly of miscellaneous facts about a person or topic, collected in a style similar to a media guide, with a list of source citations. Prose contributions to the Encyclopedia are also differentiated by a review process. This process ensures that relevant sources are cited in the article when changes are made, building the value of the Encyclopedia as a repository of links and citations to resources for researchers. This also means that Encyclopedia articles are not intended as outlets for original research. Full original articles on a topic should be published in an appropriate journal, a committee newsletter, or on the BioProject site, which will then cause them to be linked from the relevant Encyclopedia page or pages. The Encyclopedia project is a long-term, strategic initiative. The audacious goal of the Encyclopedia is nothing short of being the single best starting point for anyone wanting to review existing research on any baseball-related topic, and in doing so transform the way baseball researchers find information, disseminate knowledge, and collaborate with each other. This is not a goal that will be achieved today, and will probably not be achieved in full for several years. The strategy for reaching this goal is to pursue a path of steady accumulation. The Encyclopedia can perhaps best be thought of in terms of connections. By bringing more research resources online, cross-linking them to the Encyclopedia, and cross-linking articles within the Encyclopedia itself, connections are established across different resources and different topics. As groups pursue the development of particular collaborative projects within the Encyclopedia, new connections will be established. As more primary and secondary sources mentioning a person or topic are included on a page, further connections are made. As much as a repository for information itself, the Encyclopedia will become a "guided tour" through the web of connections among topics and sources, making it easier and easier to navigate through the wealth of information on baseball.